From the fire: NOx Emissions – these come from high temperature combustion (2O2 + N2 –> 2NO2; 2NO2 –> 2NO + O2). 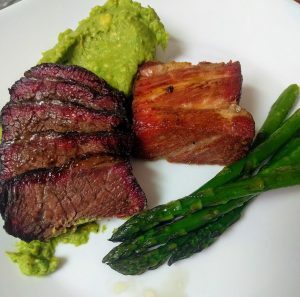 The NOx gases dissolve in the moist meat surfaces, forming nitric (HNO2) and nitrous (HNO3) acids that leach into the meat and react with myoglobin. Wood, charcoal, natural gas, and propane combustion all produce NOx, so a smoke ring can be made by most ovens. Having no combustion, electric cookers won’t make a ring by themselves. More myoglobin – beef has more than pork, which has more than fowl. Old animals have more than young ones. Recently killed animals have more. Hardworking muscles have more than lightly-used ones. More NOx emissions – from a hot fire. Wood combustion has the added benefits of producing lots of Fuel NOx (N2 from fuel) in addition to Thermal NOx (N2 from combustion air) and lots of water vapor for the NO2 to dissolve in. 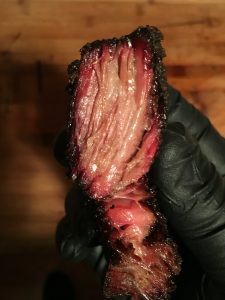 Longer exposure – load cold meat into the smoker (warning: you need a very clean fire to get away with this, as the cold meat will condense creosote from a dirty, smoldering fire). Begin the smoke at a lower temperature (~200F) for the first hour or two, then raise it to your target cooking temperature. Cheating – you can create or exaggerate a ring chemically by rubbing the meat with sodium nitrite curing salt (e.g., Tenderquick) before cooking. Most competition rules prohibit the appearance of the smoke ring from influencing scores, because it’s so easy to cheat this way. 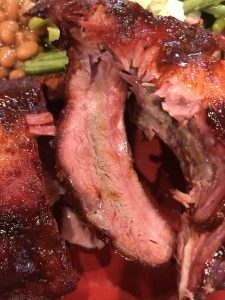 But the smoke ring adds a lot to the presentation of the meat – authentically-prepared barbecue will have it and most connoisseurs expect to see it.